Doggie Latchkey believes that all pets prefer to be in their home whenever possible, so we provide both vacation and overnight pet sitting services throughout Michigan. We will come to you so that your pet can remain in familiar surroundings while you’re away. Please take a few moments to learn more about each of these services below, and contact our office to book an appointment with a team member today. We’re an award-winning, family-owned business that truly cares about animals, and we’d love to help you with your pet care needs. Doggie Latchkey’s professional pet sitters are available for in-home overnight pet care. Your pets will enjoy hours of individual attention focused on playtime, indoor and outdoor exercise, and get lots of praise and affection that cats and dogs need while you are away. Doggie Latchkey’s overnight pet sitting service includes two walks, one before bedtime and one in the morning. If you are to be away for the entire day, we highly recommend an afternoon walk in addition to the overnight pet sitting. This service is not included in the overnight pet sitting fee, but we are happy to put together a savings package for you. The overnight pet sit ensures your pets will have the time of their life and expel lots of energy to ensure they get a good night’s rest. Your pet’s daily routines will remain the same, which is important to the health and well-being of your pet. You can travel with peace of mind knowing your pet is safe at home. Our overnight pet sits set the standard in the industry, providing the best value for this service. We can arrive at your home as early as 7 p.m., which is up to four hours earlier than the competition. We also provide a complimentary morning dog walk as part of this service. Doggie Latchkey’s overnight pet sitting services include complimentary services, helping keep your home safe and secure by giving it that lived-in appearance. Doggie Latchkey’s vacation pet sitting packages are designed for pet owners who will be away for more than one night, and they can be a much better alternative than kennels or boarding facilities. Keeping your pets in familiar surroundings with their normal routine can greatly reduce the anxiety, even when compared to even the nicest pet hotels. No matter how cute a dog hotel or cat hotel may appear, it is just not home. Our vacation pet sitting packages also include complimentary services to give your home that lived-in appearance while you are away. Doggie Latchkey’s professional pet sitters will turn lights on and off, retrieve mail and newspapers, and even curb your trash and recycling. 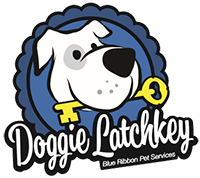 Doggie Latchkey is a fully insured pet sitting company and all of our professional pet sitters are bonded. While you are away from home, your pets can stay in the comfort of their own surroundings where they are secure with familiar sights, sounds and smells. You can relax knowing your pet is getting our undivided attention during every visit. You will not have to worry about your pets interacting with other unfamiliar animals at an overnight boarding facility or pet hotel. During the visit, your pet will be provided with food, love and playtime. As always, we’ll keep you updated on your pets via text, email or photo messages based on your preference. Call to schedule a vacation pet sitter!